3D representation of the Minato Ward (Tokyo) used for the study. Credit: Ivan Pazos et al. The increase of skyscrapers in a city resembles the development of some living systems. Spanish researchers have created an evolutionary genetic algorithm that, on the basis of the historical and economic data of an urban area, can predict what its skyline could look like in the coming years. The method has been applied successfully to the thriving Minato Ward, in Tokyo. Scientists have realized that the growth of cities follows patterns similar to those of certain self-organized biological systems. Inspired by nature, they have developed genetic algorithms that predict how the number of skyscrapers and other buildings in an urban area will increase. "We operate within evolutionary computation, a branch of artificial intelligence and machine learning that uses the basic rules of genetics and Darwin's natural selection logic to make predictions," explains architect Ivan Pazos. "In this type of computing, a multitude of possible solutions to a problem are randomly combined," adds Pazos, who currently works for a Japanese architectural firm, "and a selection system is choosing the best results. This operation is repeated again and again until the algorithms get the most accurate results." In this way, Pazos and a team of researchers from the University of A Coruña (Spain) have created algorithms -based on other standard genetic algorithms- that learn the growth patterns of urban districts using historical data from the construction sector and different economic parameters. The study, published in the Journal of Urban Planning and Development, has focused on one of the neighbourhoods with the highest vertical growth in the world in recent years: the Minato Ward, in Tokyo, where the headquarters of multinational companies such as Mitsubishi, Honda, NEC, Toshiba or Sony, are located. "This methodology could have been applied to any other city with a high number of skyscrapers," Pazos says. 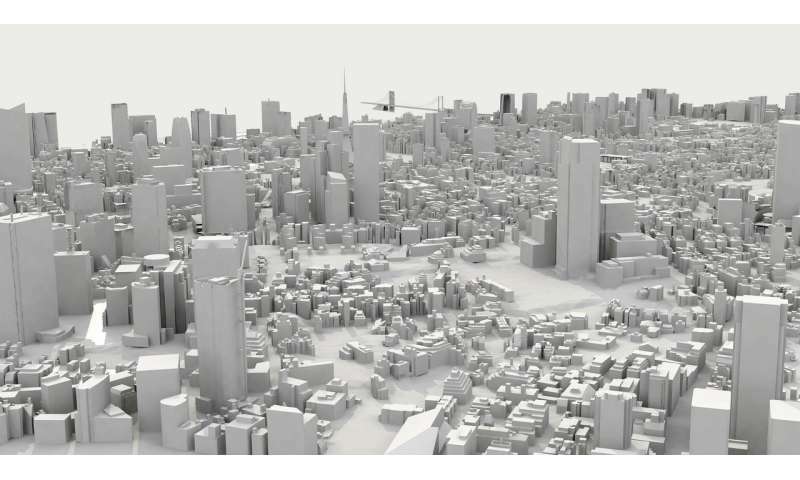 In 2015, once all the information had been gathered, the authors created a series of maps and 3-D representations of Minato to be able to predict the number of buildings and their probable locations within this booming ward in the following years during the 2016-2019 period. "The predictions of the algorithm have been very accurate with respect to the actual evolution of the Minato skyline in 2016 and 2017," says Pazos. "Now, we are evaluating their accuracy for 2018 and 2019 and it seems, according to the observations, that they will be 80 percent correct." According to the authors, the algorithm not only estimates the number of future skyscrapers in a neighbourhood of the city, but also the specific areas where they will be most likely be located. "The final conclusion of the study is that evolutionary computation seems to be able to find growth patterns that are not obvious in complex urban systems, and by means of its subsequent application, it serves the function of predicting possible scenarios for the evolution of cities," concludes Pazos. Evolutionary computation has been promising self-programming machines for 60 years – so where are they? Why is it so hot at night in some cities?